By using an upconverter, direct sampling mod, or experimental software driver the RTL-SDR can be used for HF reception. However, a problem with HF reception and the RTL2832U chip is that it uses a switching power supply in its design. This switching power supply causes significant amounts of noise spurs to appear in the HF spectrum. 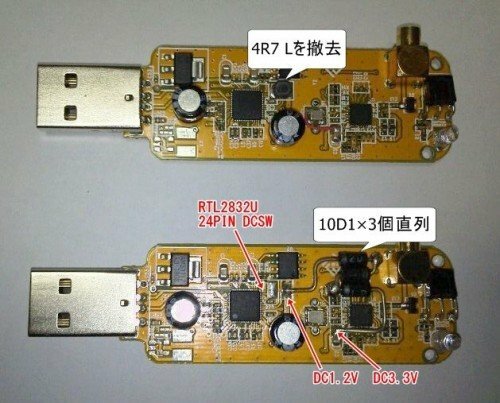 Japanese RTL-SDR experimented ttrftech has recently posted about a modification to the RTL-SDR which he performed (note in Japanese, use Google translate to read). The purpose of the switching power supply in the RTL2832U is to step 3.3v down to 1.2v. In his modification, ttrftech disconnected the switching power supply and instead stepped 3.3v down to 1.2v by using three diodes. This works as each diode has a voltage drop across it of 0.7v. His results show that there is a significant reduction in noise spurs at HF frequencies. Switching power supply replaced by three diodes. Sure with I could find this somewhere written in English layman’s terms. LOL! You don’t specify any resistors with your mod, but it looks as if you use two more components soldered directly to the LM317 (difficult to see in that picture). I thought that is how the output voltage of an LM317 was determined, by which value resistors are connected to it, but those parts almost look like caps? Jesse ! Sorry for waiting you. The resistor value is 240 Ohm, (between the LM317 Adjust – Output pin) and this need for proper works for LM317. See datasheet : https://www.fairchildsemi.com/datasheets/LM/LM317.pdf The another two component is a ceramic capacitors, value is 4700nF (4u7) and these capacitor (between the GND-Output and GND-input) is not needed for stability, however improve the transient response. I’d like to know where this ‘switching’ regulator is. unless it is contained within the rtl2832 chip itself, i see no active components on the board that constitute a switching regulator. unless it is contained within the rtl2832 chip itself.. It is indeed contained within the RTL2832U chip itself. The reason I am asking the questions is that I don’t see any noise spurs in my setup that I have when I disconnect the antenna . I have a nice clean base line . Now when I am connected to the antenna I do see a lot of noise spurs . I am doing a direct sampling and I use a mfj 1020c for the PRESELECTOR and it has a rf amp in it . I do have some more questions , have you looked at the output voltage of the switching power supply with a scope ?? Have you tried suppressing the noise spurs with a capacitor , one who’s value will shunt the spurs to ground ? One more thing and have you tried disconnecting the antenna before you did the mod to the dongle to see if the noise spurs were still their ?? I am sure the Japanese experimenter has tried capacitors with no luck so added the new diodes and removing the other one gave him less noise. Wouldn’t we see a mod with capacitors instead of diodes? @robert, 40m HF can be received by using modified software driver without any upconverter. I am receiving 40m for last few months with verygood result. During October DX contest I even received N0CT on 40m band Indonesian and Chinese HAMs are heard most of the time, Rusian region HAMs are heard sometimes. 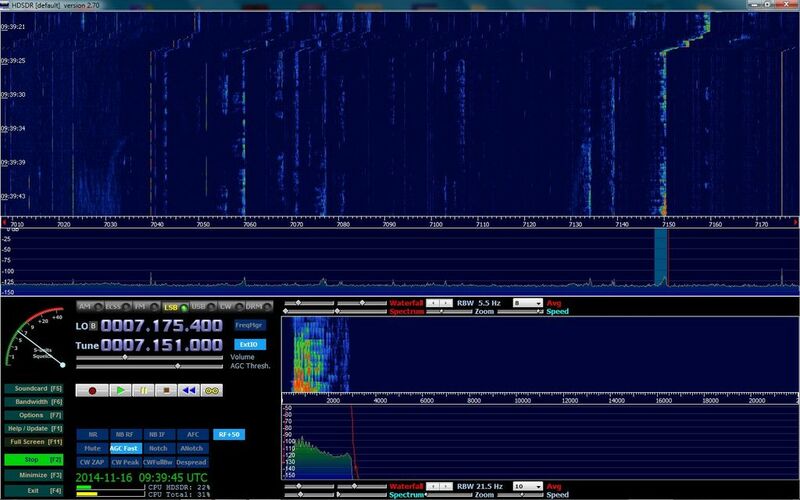 For your reference My QTH is NL20WL, I use Fedoralinux with GQRX and Modified driver. How’s he getting -125 noisefloor initially and after the mod it’s even lower! After reading the little right up on how to reduce noise on the tv dongle , I have a question or two . How is he receiving 40 meters without a up converter or direct conversion ? I would think all a person would have to do is disconnect the antenna to see if the dongle is generating any internal noise ??? He is using an upconverter. The one he’s using is this one.